FGQCanvas windows showing the PFD and ND of the Boeing 747-400. 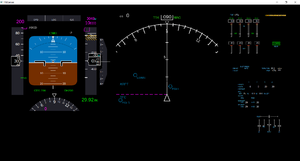 FGQCanvas is a Qt-based remote canvas application for FlightGear. This app can connect to a FlightGear instance which has the built-in HTTPD server enabled and display any canvas in real-time. 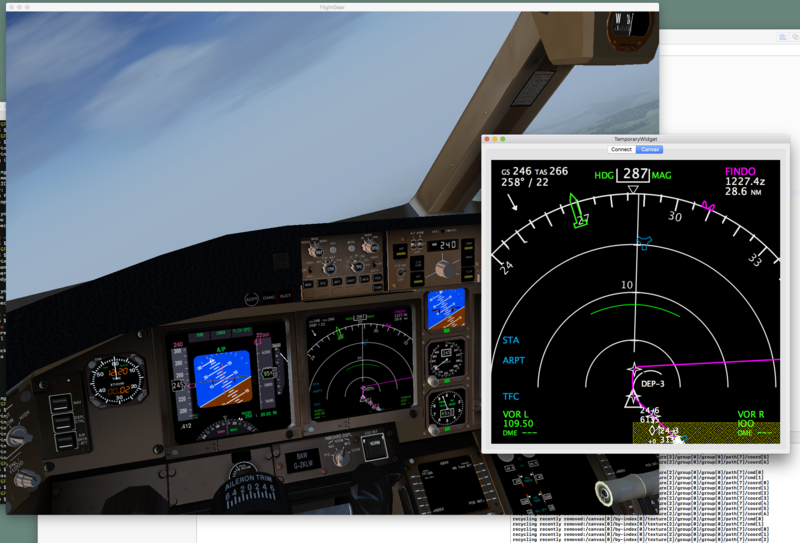 See $FLIGHTGEAR_SRC/utils/fgqcanvas/README.md for instructions on how to use FGQCanvas. James has spent some of his time since FSWeekend 2016 figuring out how he might drive some ‘real’ CDU hardware from the in-aircraft CDU options, and went for a slightly ambitious approach: he's written an analogue of FGPanel for the canvas. Analogue is actually not quite correct - unlike FGpanel this connects at the view level (canvas properties), it doesn’t run the canvas ‘model’ locally, since that would be very tough (Nasal + whole property tree needed). This distinction was unimportant for the canvas up until now, but it’s going to become important he expects. This was prompted by his intention to buy something like this: http://www.flightdecksolutions.com/components/b737ng/b737ng-mipmain/fds-b737ng-pro-mx-cdu-color-vga/ Which means James needs the CDU screen running on its own screen/device nicely. And he already wrote a page-based Canvas CDU over a year ago, it’s just sitting on Gijs’ hard-drive awaiting being merged. James is very happy with this approach so far, since any Canvas display can be trivially run out-of-process, remotely on an Android tablet, Raspberry Pi, iPhone or whatever. (he is hoping to make an app available on the Play store and App store, but one thing at a time). The 777 ND and lower EICAS pages work and look great at larger sizes. James also investigated using a binary protocol for doing the mirroring, current one is an optimised JSON protocol but swapping in a binary protocol is very doable in the future. ↑ zakalawe (Dec 10th, 2016). .
↑ James Turner (Dec 10th, 2016). [Flightgear-devel] Announcement: Remote canvas . This page was last modified on 27 January 2017, at 06:10.